樊利鹏, 刘文畅, 谭洪新, 罗国芝, 孙大川, 张南南, 曹宝鑫. 光照条件下生物絮凝养殖调控的措施[J]. 上海海洋大学学报, 2019, 28(1): 84-92. FAN Lipeng, LIU Wenchang, TAN Hongxin, LUO Guozhi, SUN Dachuan, ZHNAG Nannan, CAO Baoxin. Control measures of biofloc-technology aquaculture under light condition[J]. Journal of Shanghai Ocean University, 2019, 28(1): 84-92. CRAB R, AVNIMELECH Y, DEFOIRDT T, et al. Nitrogen removal techniques in aquaculture for a sustainable production[J]. Aquaculture, 2007, 270(1/4): 1-14. 谭洪新, 庞云, 王潮辉, 等. 驯化硝化型生物絮体养殖南美白对虾的初步研究[J]. 上海海洋大学学报, 2017, 26(4): 490-500. TAN H X, PANG Y, WANG C H, et al. Preliminary study on domesticating nitrifying bioflocs to rear Litopenaeus vannamei[J]. Journal of Shanghai Ocean University, 2017, 26(4): 490-500. 国家环境保护总局, 水和废水监测分析方法编委会. 水和废水监测分析方法[M]. 4版. 北京: 中国环境科学出版社, 2002: 836. State Environmental Protection Administration of China, Editorial Board of Monitoring and Analysis Methods for Water and Wastewater. Methods of monitoring and analyzing for water and wastewater[M]. 4th ed. Beijing: China Environmental Science Press, 2002: 836. 国家海洋环境监测中心. 海洋监测规范第4部分:海水分析[M]. 北京: 中国标准出版社, 2004. National Marine Environment Monitoring Center. The specification for marine monitoring part 4:seawater analysis[M]. Beijing: Standards Press of China, 2004. 国家海洋局第三海洋研究所. 海洋监测规范第7部分:近海污染生态调查和生物监测[M]. 北京: 中国标准出版社, 1998. The Third Ocean Research Institute of the State Oceanic Administration. The specification for marine monitoring part 7:ecological survey of offshore pollution and biological monitoring[M]. Beijing: Standards Press of China, 1998. 谭洪新, 胡煜昂, 梅志平. 鱼池生态系统中影响浮游细菌生长制约因素的研究[J]. 应用生态学报, 2002, 13(1): 95-100. 牛海玉, 肖利娟, 韩博平. 采用倒置显微镜法定量浮游植物的数据稳定性[J]. 湖泊科学, 2016, 28(1): 141-148. NIU H Y, XIAO L J, HAN B P. Data quality analysis of phytoplankton counted with the inverted microscopy-based method[J]. Journal of Lake Sciences, 2016, 28(1): 141-148. 胡鸿钧, 魏印心. 中国淡水藻类系统、分类及生态[M]. 北京: 科学出版社, 2006: 1023. HU H J, WEI Y X. Freshwater algae of China systematics, taxonomy and ecology[M]. Beijing: Science Press, 2006: 1023. 韩茂森, 东蕴芳. 中国淡水生物图谱[M]. 北京: 海洋出版社, 1995: 375. HAN M S, DONG Y F. Freshwater biological map of China[M]. Beijing: Maritime Press, 1995: 375. 蒋燮治, 堵南山. 中国动物志-节肢动物门甲壳纲淡水枝角类[M]. 北京: 科学出版社, 1979: 297. JIANG X Z, DU N S. Chinese fauna arthropoda, crustacea, freshwater cladocera[M]. Beijing: Science Press, 1979: 297. 孙军, 刘东艳, 钱树本. 浮游植物生物量研究Ⅰ.浮游植物生物量细胞体积转化法[J]. 海洋学报, 1999, 21(2): 75-85. 左涛, 王荣. 海洋浮游动物生物量测定方法概述[J]. 生态学杂志, 2003, 22(3): 79-83. ZUO T, WANG R. Measuring methods of marine zooplankton biomass[J]. Chinese Journal of Ecology, 2003, 22(3): 75-83. 史明明, 刘晃, 龙丽娜, 等. 碳源供给策略对水产养殖废水生物絮团处理效果的影响[J]. 农业机械学报, 2016, 47(6): 317-323. SHI M M, LIU H, LONG L N, et al. Effect of carbon source supply tactics on treatment of aquaculture wastewater with biofloc technology[J]. Transactions of the Chinese Society for Agricultural Machinery, 2016, 47(6): 317-323. 白洁, 张昊飞, 李岿然, 等. 海洋异养浮游细菌生物量及生产力的制约因素[J]. 中国海洋大学学报, 2004, 34(4): 594-602. BAI J, ZHANG H F, LI K R, et al. Limiting factors of biomass and production of marine heterotrophic bacterioplankton[J]. Periodical of Ocean University of China, 2004, 34(4): 594-602. 孙欢, 张永东, 于谨磊, 等. 外源溶解性有机碳对抚仙湖甲壳类浮游动物碳源的贡献[J]. 湖泊科学, 2017, 29(4): 887-895. SUN H, ZHANG Y D, YU J L, et al. Contribution of allochthonous dissolved organic carbon to the carbon source of planktonic crustaceans in Lake Fuxian[J]. Journal of Lake Sciences, 2017, 29(4): 887-895. 黄邦钦, 洪华生, 王大志, 等. 台湾海峡浮游植物生物量和初级生产力的粒级结构及碳流途径[J]. 应用海洋学学报, 2002, 21(1): 23-30. 罗国芝, 柳泽锋, 谭洪新. 养殖用水重复利用过程中的C/N[J]. 水产科技情报, 2018, 45(1): 34-41. LUO G Z, LIU Z F, TAN H X. C/N in the process of reuse of aquaculture water[J]. Fisheries Science & Technology Information, 2018, 45(1): 34-41. 王娇, 马灌楠, 邓元告, 等. 葡萄糖和盐度对卤虫生长、养殖系统生物絮团形成及其微生物多样性的影响[J]. 海洋与湖沼, 2015, 46(2): 372-380. WANG J, MA G N, DENG Y G, et al. Effects of glucose and salinity on Artemia growth, biofloc formation, and microbial diversity in culture[J]. Oceanologia et Limnologia Sinica, 2015, 46(2): 372-380. 王小冬, 孙军, 刘东艳, 等. 海洋中型浮游动物的选择性摄食对浮游植物群落的控制[J]. 海洋科学进展, 2005, 23(4): 524-535. 谢萍, 席贻龙, 温新利, 等. 两湖泊轮虫群落结构的时空动态对水体氮磷含量及"下行效应"的响应[J]. 生态学报, 2015, 35(14): 4763-4776. XIE P, XI Y L, WEN X L, et al. Responses of the spatio-temporal dynamics of rotifer community structure to the concentrations of N and P, and the effect of top-down in two lakes[J]. Acta Ecologica Sinica, 2015, 35(14): 4763-4776. 林涛, 崔福义, 陈卫, 等. 鱼类控制水蚤类浮游动物孳生的下行效应试验[J]. 南京理工大学学报(自然科学版), 2008, 32(5): 646-650. Abstract: By using the method of experimental ecology, the water in the early stage of BFT aquaculture was used as the experimental material.The effects of bacteria free predators (protozoa etc., group AC), group with shrimp order supplemented with glucose (group GS) and single dose of glucose (group G) on bacteria and plankton in water were investigated. The results show that the biomass of rotifer, phytoplankton and concentration of chlorophyll-a in group GS were significantly higher than those in control group (P < 0.05) in 120 h, while the biomass of rotifer and the phytoplankton in the group G had no significant difference from the control group (P>0.05) during the whole experiment (P>0.05), so the bottom-up effect of the sequential batch addition of glucose was more obvious than that of the one-off addition, and the top-down effect of group GS with large predators was not obvious. 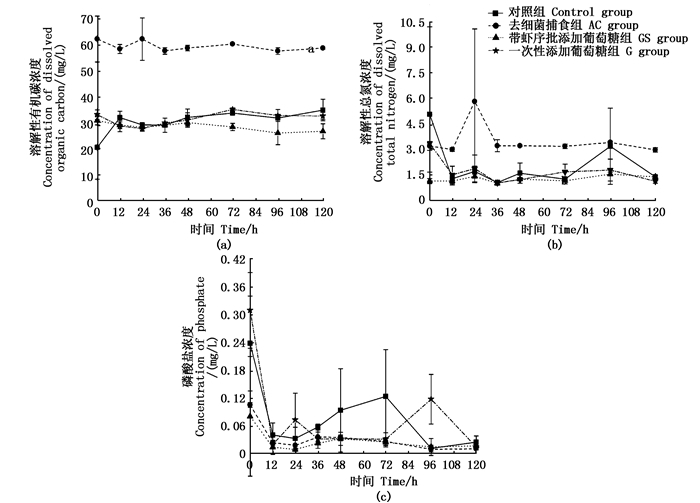 The total number of bacteria in the experimental group and the control group was higher than 5×105 cells/mL. 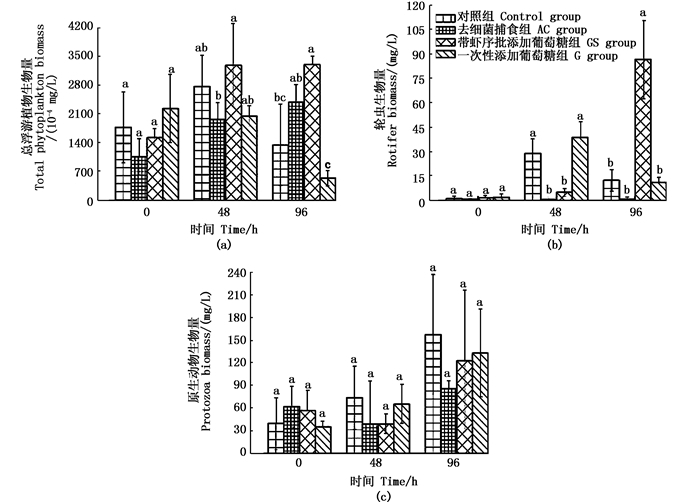 The highest peak number of bacteria was (13.10±3.79)×105 cells/mL in group AC, which reduced the predation pressure on the bacteria and promoted the growth of the bacteria after removing the bacterial predator. The dissolved organic carbon concentration and dissolved total nitrogen concentration in the group AC were always higher than those of other groups. In the group GS, group G and the control group, the concentrations of dissolved organic carbon, total dissolved nitrogen and phosphate were basically consistent.Killing bacterial predator released a large amount of dissolved organic matter, adding appropriate amount of glucose, and adding shrimp had no obvious effect on the water quality of culture. Killing bacterial predator released a large amount of dissolved organic matter. Adding appropriate amount of glucose and adding shrimp had no obvious effect on the water quality of culture. The results provide the basis for control measures on sunshine biofloc-technology aquaculture in production.